Rena Ellen Jones was born on the 30th September 1894. She was the second daughter of Ralph Jones, a produce merchant from Bendigo and Charlotte Ellen Ralph also of Bendigo. Rena was educated at Golden Square State School and Bendigo High School. Rena trained to become a primary school teacher and taught in Camberwell. She contracted Rheumatic Fever in her early 20’s, an illness that affected her with an ongoing heart condition for the rest of her life. 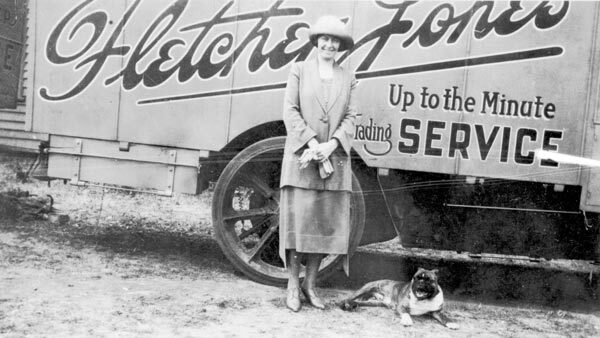 After her marriage to Fletcher on the 22 September 1922 she joined him as part of the team travelling the Western District and South East South Australia. She learnt to drive one of the trucks and provided her husband with full support and encouragement. After settling in Warrnambool in 1924 she continued her support through very difficult times. She proved herself to be a good housekeeper, mother, and council through the times of hardship and continued in this role as the business developed and grew. She enjoyed sporadic good health through the 1950’s and 1960’s and enjoyed travelling with Fletcher until her death on the 9th April 1970.